On previous trips to Melbourne we had noticed the Bowery to Williamsburg sign a few times on our way to one place or another and finally our curiosity got the better of us. Being a Friday morning it was the CBD office workers that were the majority in the cafe but it was still quite easy to get a spot. 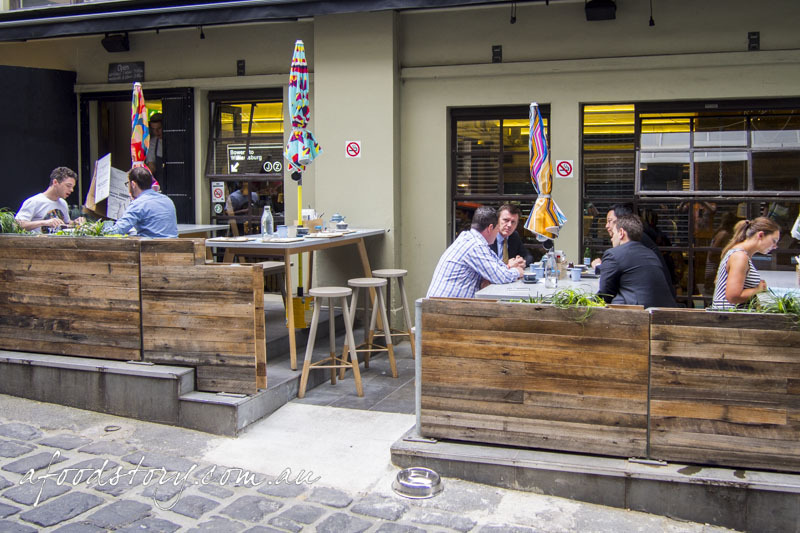 Almost all of the seating is shared, with a long table able to accommodate around 12 people and a few other smaller tables inside for good measure. We were seated and given our menus, coffee orders were taken (strong lattes) and we began perusing the selection. It was harder than I thought as they serve quite a different fare compared to a typical Australian cafe, this was New York style through and through. Yes, I will admit it, I ordered the cubano because of the movie Chef. I knew very little about them before I watched it, but afterwards all I wanted was one of those sandwiches in my mouth. It turns out finding them is hard, way harder than it should be anyway. 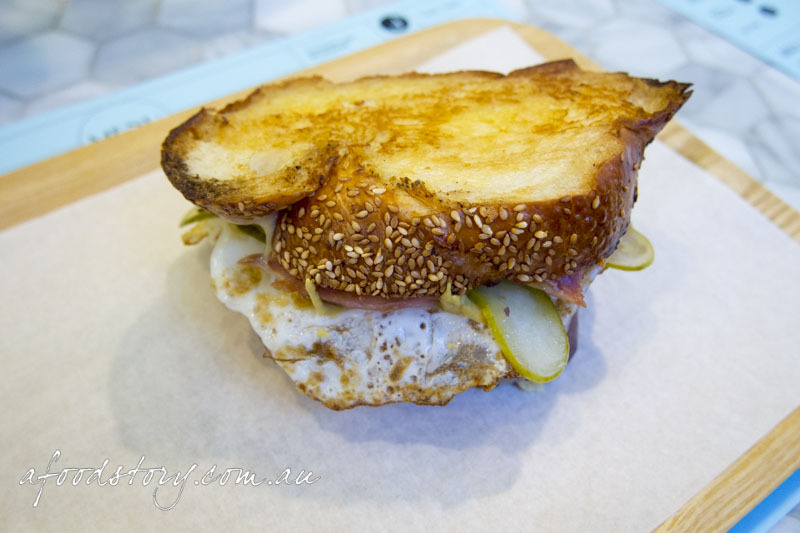 The whole concept of their Good Morning Cubano Sandwich seemed to be tailored to my tastes, it was only the egg I wasn’t too keen on, but without it they couldn’t really call it a ‘Good Morning’ sandwich. Generously filled with soft and salty ham hock there was a lot going on and I really enjoyed the first half, a bit of pickle here, a nice dose of mustard there with some stringy cheese binding it all together but after a while my non-breakfast eating stomach was done. It was a nice sandwich, but not awesome enough for me to keep eating regardless of how full I was. In the end it was just too much to finish. 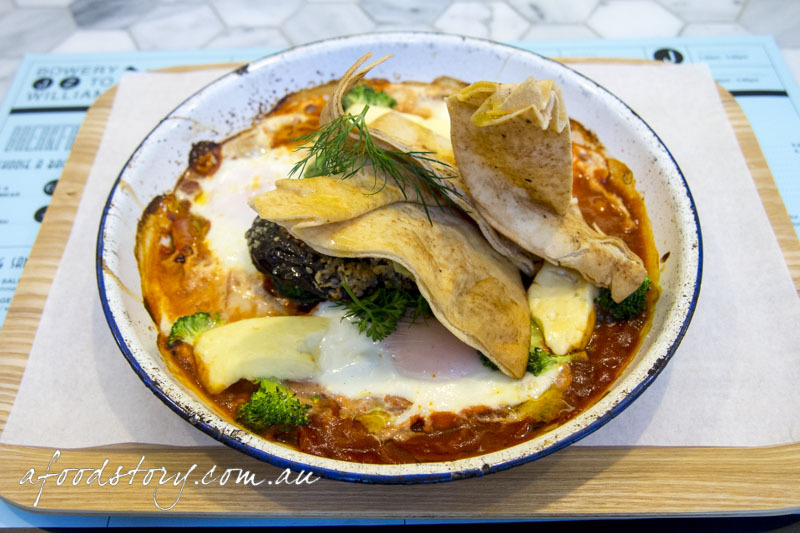 Shakshouka Baked Eggs – Broccoli / sesame breaded eggplant / haloumi / fresh herbs ($18.00). Lex was torn between the mushroom ragout and the baked eggs, and when she decided on the baked eggs she was then torn between smoked salmon or the vegetarian option of broccoli. It was the haloumi that sealed the deal and Lex went for the vego option. When it arrived we both looked at each other and gave a little gasp, this thing was massive. Although the haloumi was the draw card for Lex I think it was the sesame breaded eggplant that claimed top spot here, juicy and soft the eggplant worked so well with the toasted sesame coating. Both the eggs and cheese were good but we both hoped the tomato sauce would have had more of a spice kick to it. Much was the same with the bread – it was a great little number but missing the all-important ability to soak up the sauce and yolk. There was nothing wrong with the dish, on the contrary each element was great, but the sum was not greater than its parts. 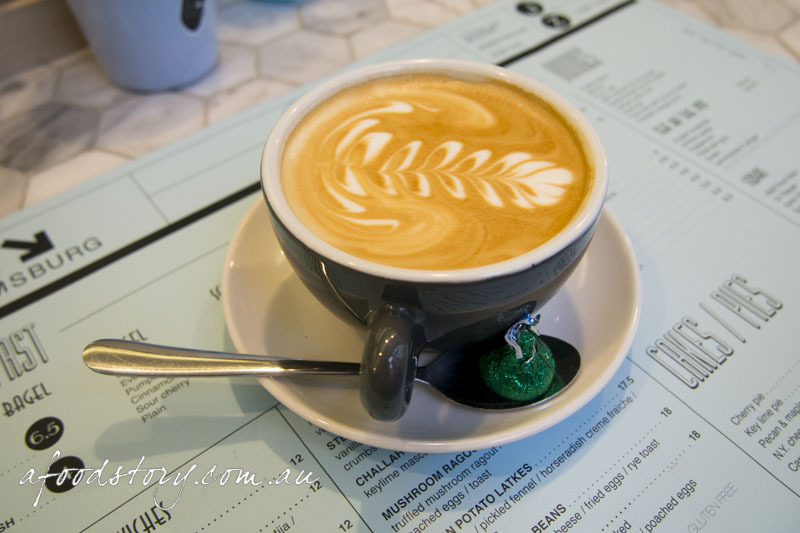 What I love about this place the most is the purity of the menu, there are no ‘Aussie’ compromises (except good coffee) and by keeping to this they offer something quite unique. We both thought our dishes were good but lacked that final touch to be great. That being said we wouldn’t hesitate to come back next time we are in the neighbourhood. And another thing worth noting is that this was only the breakfast menu. Having taken a peak at the lunch menu I noticed a few things that caught my eye, none more so than the Philly Cheese Steak; next visit I will be making sure I order one of those puppies.